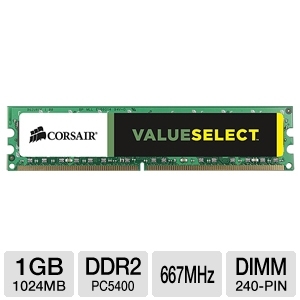 Boost your desktop PC�s overall performance with the Corsair Value Select 1GB Memory Module. It provides you a whole new and energized PC performance for you. This PC5400 DDR2 module is all set to deliver a brilliant data management and it saves a lot of time allowing you to do things you love. With a memory size of 1024MB along with a speed of 667MHz, multitasking can be done in a very effective way. A total memory of 1GB lets you store all your files and ensures fast boot-up and resource management. Integrating the module into your system is simpler with the 240 pin DIMM socket. Order the Corsair Value Select 1GB Memory Module for a faster and time saving computing experience.